French Citizens SHOCK Leftists with Chant "We want Trump!" How often can I be right? As much as President Trump said Americans will win. As France burns from years of socialist rule, America goes through a Renaissance. The difference is America elected a real leader and not a chump. We watched for 8 years as our black version of Emmanuel Macron ruined the country. Over $8 trillion worthless dollars printed then pumped into an anemic economy, and the black Boy Wonder felt like a rock star. France suffers from the same delusion. The election of Macron was to be a cure for all ills. After all, he looked good. And don’t forget his first encounter with Donald Trump, where Macron would show the U.S. leader who’s boss. The adoring Leftist media in America loved Macron as well. MSNBC’s Joy Reid even quipped that she wished Macron could reside over America as well as France. 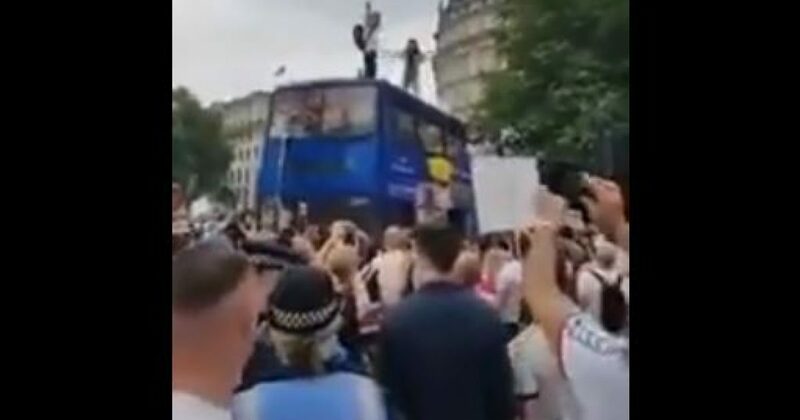 A man in a Trump mask gets the crowd going, as he stands on top of a bus! Yes, America, President Trump is the man. And don’t think France is the only place they prefer him as president. Trump impacts the world. And though the media refuses to report it, the world now follows the U.S.
President Trump has restored order. His policy of national sovereignty has world leaders rethinking their previous positions. Trump’s America First doctrine now resonates with other leaders, who no longer take this as America bravado. Instead, they see this as the natural order of things. To put one’s country first doesn’t mean you consider yourself better. Countries must recognize their unique cultures and preserve those cultures where it suits their interests, and hopefully the world’s interest. The previous Leftist doctrines have ruined the world, particularly as it relates to mass immigration. While refugees pour out of Middle Eastern, African, Central and South America, they migrate to Western countries. These refugees have changed the demographics drastically, and the political landscape even more so. President Trump recognizes that far too many refugees and illegals, in the case of America, have diminished American culture. Neither group sees America as their ancestors did: the land of opportunity. Instead, now refugees and illegals see America as a place to take advantage of. The same is true of refugees pouring into Europe. Thus, the new stance by many European leaders who now adopt the Trump Doctrine. They reject the UN’s “standardized migration” pact, that cedes their countries to illegals and refugees. The man who supposedly had the lowest poll numbers entering the presidency will likely have the highest exiting the presidency…in six years. Speaking of polls, the Left don’t reference any real ones often. Because those numbers grow almost daily for Trump. They have since his election. At the two year mark of Trump’s presidency, he polled better than Obama. While that scared the Left going into the midterms, what his numbers will be this time in 2020 will cause cardiac arrest. Obama’s approval rating was reaching a record low in October 2010, just before his party lost a significant number of seats in the House and Senate. How many videos of have we seen of YouTube personalities or comedians going out and asking simple questions about current events, politics and history on the street, where the average voter knows nothing on either side of the microphone. Most leftists are sheep; products of a marketing culture that tells them what to think and how long to think it. When not branding Trump supporters as “Nazis,” the establishment whines about the lack of civility in American politics. Then they wholly dismiss or cover for mob violence and public harassment of the president’s staffers or supporters. The 61 percent of Democrats who claim Republicans are racist and sexist should look at the history of their own party when it comes to both. The Democrat party is the party of Barack and Michelle Obama. They also claim Linda Sarsour, Louis Farrakhan, and Keith Ellison, to name just a handful of racists. Democrats fought to keep slavery, enacted Jim Crow laws, formed the Ku Klux Klan and replaced chains with Planned Parenthood abortions and welfare. Things don’t look good for Leftists. The Mayor of Tijuana donned his Tijuana equivalent of the MAGA hat. Yet, the media slept. Now we have France asking for Trump?! After two years of Obama, I don’t think any country wanted him. After eight years of Obama, I know no country wanted him. The lamestream, fake news American media will be forced to confront their demons soon. They will eventually report on the booming economy, the improved condition of the world, and Trump’s triumphs. All we have to do is wait a little bit longer.